Everett Districts Now and its partners are encouraging residents of the City of Everett to apply to serve on Everett’s District Commission. Serving on this important commission means having a major, positive role in shaping Everett’s future for fairness, equity, diversity and inclusion. In November 2018, Everett voters approved a change in how we vote for our city council members. Instead of voting for our 7 council members citywide, the new system will create five geographic voting districts for 5 City Council seats and keep 2 seats citywide. 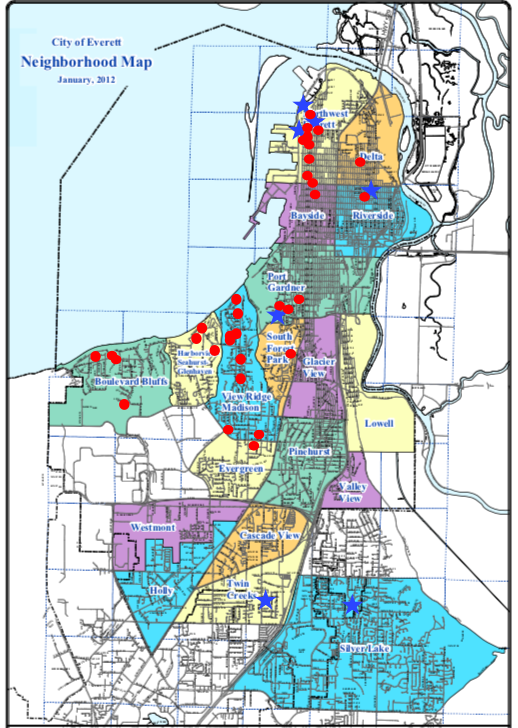 Historically, a majority of Everett’s residents have lived south of 41st Street, but most of our elected officials have lived in the north of the city – causing many neighborhoods to not have a direct voice in local government. Through a grassroots, volunteer effort and partnering with the Snohomish League of Women Voters, Snohomish NAACP and other organizations, Everett Districts Now worked with the city to put a districts initiative on the 2018 ballot. Everett’s decision to change the election system joins with the decisions of other cities in Washington that have implemented districting. They have recognized that districts increases representation for all city communities. A great example of the value of districts is in the city of Yakima which has a Latino population of 40%. After implementing districts,Yakima elected three Latino City Council representatives for the first time in history. The implementation of the 5/2 districting plan starts with the creation of a 9-member District Commission. The current 7 City Council members and the Mayor of Everett will each appoint one member to the commission from a pool of applicants,. The 8 appointed members will then choose a 9th member. The first job of the 9 commission members will be to hire a professional District Master to analyze population data and suggest district map boundaries. Then the 9 person commission will draw up a plan, determine the boundaries of the districts and seek input from the community. State law requires districts to have equal population, to be compact and to be geographically connected. The law also allows the District Commission to take into account areas of ethnic or cultural density that would lose representation if divided into separate districts. The District Commission’s plan will be submitted to the City Council and approved without modification. The District Commission will start its work in August 2019 and complete it by November 2020. Full implementation of district elections of all 5 districts will be in November 2021. 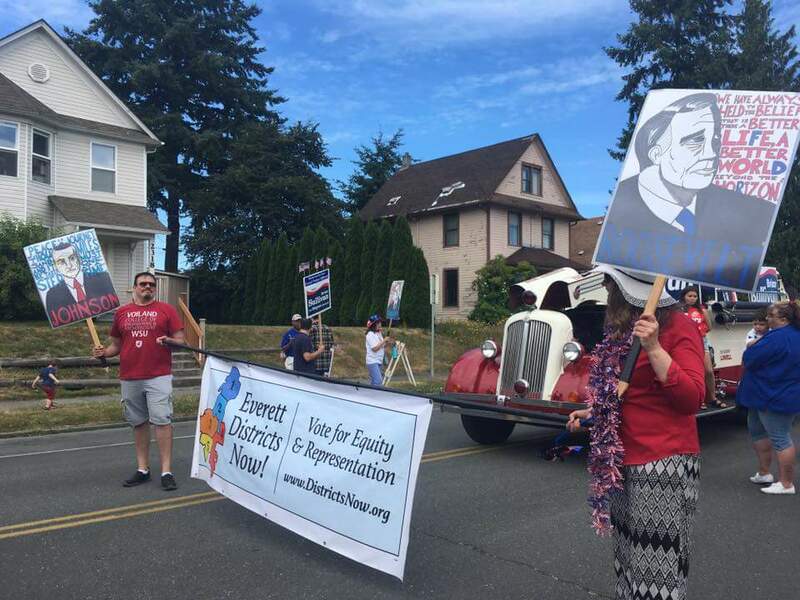 Everett Districts Now in partnership with the Snohomish League of Women’s Voters, Snohomish NAACP and other organizations believe the District Commission should directly reflect the diversity of the residents of Everett and be geographically representative of all areas of the city. We are encouraging the communities and people of Everett to apply for the commission. We need you and your unique knowledge about your community! No prior civic experience is necessary. The only requirement is that you live within the city limits of Everett. However, you cannot be a city employee, an elected public official or a candidate for public office. To learn more about districting and to fill out the application for the District Commission, go to the City of Everett’s website at www.everettwa.gov/districting. The application deadline is Tuesday, April 30th. For more information read this research summary by the National Association of Cities. The summary states, “Mixed systems which provide more district seats than at-large seats are more likely to stand Constitutional scrutiny.” The Everett Districts Now plan has 5 at-large or citywide seats and will therefore be more likely to withstand legal scrutiny. This map shows the neighborhoods of Everett. Red dots are locations of city council members from 1980 to 2017. Blue stars are the locations of the council members now. As you can see, there are areas of the city with a historic lack of representation and some areas that have never had direct representation. 5 of our 7 council members live north of 41st Street, while the majority of our city residents live south of 41st Street. This is not fair and equitable representation. Historically that has been the case, and it results in many neighborhoods having no direct voice in local government. Will District Elections Cost More Money? No! According to the Snohomish County Auditor there is no increased cost for district based ballots. Districts do not result in any additional staff or new councilmembers. The only cost associated with districts is the occasional creation of district commissions for setting district boundaries to balance populations between districts in accordance with state law. Why Five Districts Instead of Four? Five districts means that even if both at-large council members lived in the same district they would not control a majority of council votes. Under a four district model three at large council members living in the same district would, combined with the district council member, control the council by a majority. Five districts provides better representation and prevents any district from having a majority of votes. Who Supports Having Five Districts? You and your Everett neighbors! A survey by the City of Everett indicated that 80% of those responding wanted Everett to elect council members by district, and 74% of those responding wanted Everett to have five or more districts! Five districts is also supported by Councilmembers Brenda Stonecipher and Judy Tuohy, the League of Women Voters, the NAACP, Everett Firefighters 46, Carpenters Union 70, Snohomish County Young Democrats, Snohomish County Democrats, Snohomish County Libertarians and the National Women’s Political Caucus of Washington. See the full list on our endorsements page!. Read the full press release by Everett Districts Now! Currently, all council members are elected at-large, as a result, 5 out of 7 live in the northern part of the city. Districts would ensure fair and equal representation across the entire city. A city government that comes from the people will better serve all people. Register to vote and get your current voting information from the Washington Secretary of State. Creating council districts will promote equal and fair representation on the Everett City Council.